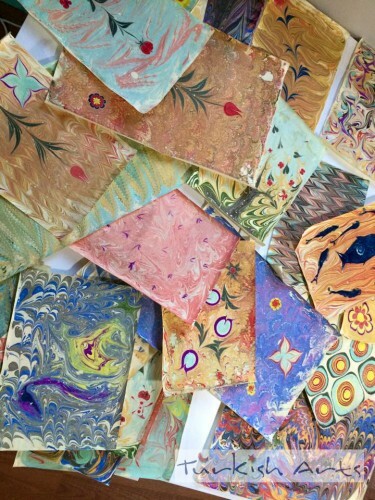 Ebru Marbling is the art of creating colorful patterns by sprinkling and brushing color pigments on a pan of oily water and then transforming this pattern to paper. The word ‘ebru’ comes from the Persian word ‘ebr,’ meaning ‘cloud.’ The word ‘ebri’ then evolved from this, assuming the meaning ‘like a cloud’ or ‘cloudy,’ and was assimilated into Turkish in the form ‘ebru.’ The special tools of the trade are brushes of horsehair bound to straight rose twigs, a deep tray made of unknotted pinewood, natural earth pigments, cattle gall and tragacanth. It is believed to be invented in the thirteenth century Turkistan. This decorative art then spread to China, India and Persia and Anatolia. Seljuk and Ottoman calligraphers and artists used marbling to decorate books, imperial decrees, official correspondence and documents. New forms and techniques were perfected in the process and Turkey remained the center of marbling for many centuries. Up until the 1920’s, marblers had workshops in the Beyazit district of Istanbul, creating for both the local and European market, where it is known as Turkish marble paper. 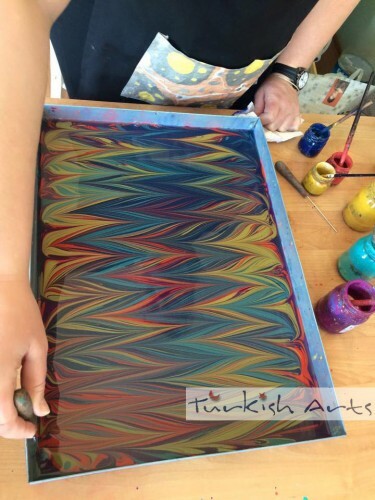 Like in other arts, Ebru Marbling is learnt in a “Master-Student” relation with many prominent Master (called Ebrizen) available in Turkish history. Although the art can be learnt with a single day practice but the real Masters of the art usually have spent lives in practicing new patterns to be perfect and their work is usually unparalleled and truly reflect the touch of genius. Marbling art or Turkish Ebru art is one of the most beautiful examples of art in the world. It is an art that has differences from the other visual ones in the ways such as equipments used, performing style and traditional aspect and it is the art of paper decoration by spreading paints, which do not dissolve in water and shapes like clouds. It is a method of aqueous surface design, which can produce patterns that are the result of color floated on either plain water or a viscous solution and then carefully transferred to an absorbent surface, such as paper or fabric. Through several centuries, people have applied marbled materials to a variety of surfaces. It is often employed as a writing surface for calligraphy, and especially book covers and endpapers in bookbinding and stationary. Part of its appeal is that each print is a unique monotype. Someone very rightly said once that “Ebru is not only an Art, it is also an epigrammatic poem and a heart felting melody…”. In more literary context we can describe it as “the art, sprinkled on solidified water with raising consistency substances like tragacanth having fluidity and transferring the pattern that is made by shaping dye drops on water”. The colour is transferred from the surface of a liquid to the paper and hence the pattern is formed. It is a very enjoyable form of art but since it takes time and care therefore it requires patience and passion while performing. Ebru can be performed not only on the paper but also the clothes, wood and potteries. Throughout history the Masters have prepared many different types of Ebru. Each of these had their own names, reflects a unique art, itself is an example of creativity, sign of elegance and pictures the message for the nourishment of eyes and soul. 1- Fantazi – Fantasy 2- Kedi Gözü – Cat Eye 3- Dalgalı – Waved C- Flowered Ebru; Forms of flower motifs are applied on battal ebru. Application process is quite different from oil painting. 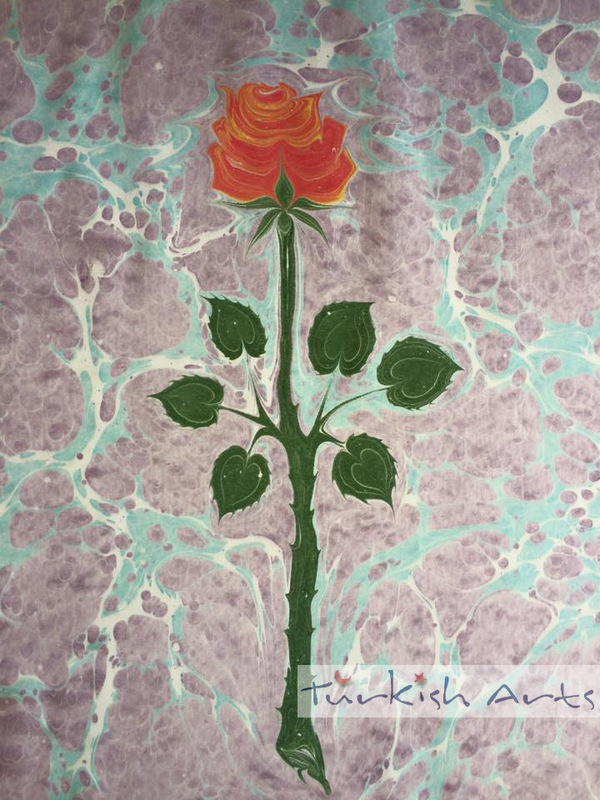 Ebru master has to form the flowers and get the image on paper rapidly, before the paints on the water start cracking. Therefore this art should not be compared with the art of painting. 1- Lale – Tulip 2- Karanfil – Carnation 3- Sümbül – Hyacinth 4- Demet Çiçek – Flower bunch 5- Renkli Menekşeler – Multicolored violet 6- Papatya – Camomile / Daisy 7- Gelincik – Poppy 8- Gül – Rose 9- Buket – Bouquet • All these different types of Ebru have their own combinations of dyes, drawing techniques and have different levels of difficulty in preparation and different methods, in general, but the equipment used is almost the same for many of these types. Through practice and passion, candidates can learn all of them and enjoy the perfection of this beautiful art. Our Professional Marbling (Ebru) Set is available for supply in our centre. Interested parties are required to pick it up from our Centre since the delivery service is not provided. – Basin – Tray (Tekne): It is the container in which the Ebru is prepared and it can be made from galvanized plate, chrome, glass or wood. It has to be 1-2 cm longer on each of its side than the size of material (paper, etc.) you want to work with. The size of a typical ebru tray is 35 cm by 50 cm long and 5-6 cm in depth. -Carrageenan (Sea weed) ;Preparation Instructions: To make a half gallon of size: Add 1 level tablespoon + 1 level teaspoon of carrageenan into a blender. Fill it up to the top with cold water. Blend it on the highest speed for 1 minute. Pour the foamy mixture into a 1/2 gallon container (i.e. empty plastic milk jug) & fill it to the top with water. Shake it. Let stand overnight in the refrigerator to let the foam bubbles pop. The size will last ~ 10 days in the refrigerator When it begins to lose its thickness and becomes watery it is no longer good for marbling. Ordinary tap water is usually fine for making the size. If you have hard water, or heavily mineralized tap water you may want to substitute distilled water. You can print 20 – 25 sheets on a tray of size. – Dyes (Paints): The colors used in marbling are obtained from different natural substances such as soil, lahor indigo etc. The dyes are liquid and are insoluble in water and are not affected from sunlight. They are sold as oxide and pigment paints in the powdered form. · The preparation method is; The marbler has to mix the oxide pigments on a marble or glass surface for 1.5 to 2 hours using a special technique. Then the paints have to be left standing for 1-2 months. After that the water is drained away and the sinked colors are used. (Our pigments are ready made and are in the cream form) · There are no specific measures for the dyes used in the painting. Different pigments have different characteristics and therefore the preparation of dyes requires verification with water and ox gall. – Brushes: They are made of horsehair with a rose branch handle. They are preferred over modern brushes due to light weight of the rose bud, its flexibility and that the horse hair does not absorb dyes. 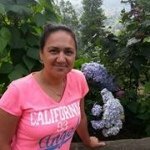 · They are prepared very carefully with a special technique to tie up the hair. The length and thickness has to be proper for perfection in the Ebru artwork. – Oxgall or Bile (Öd): It allows the paint to disperse over water without precipitating. Oxgall (not synthetic oxgall) comes from a bovine bladder and it can be obtained from slaughterhouses. If it is boiled with the ‘double boiler’ method (bain marie), then it can be preserved and used for a long time. · Ox Gall is the major item of the Ebru. 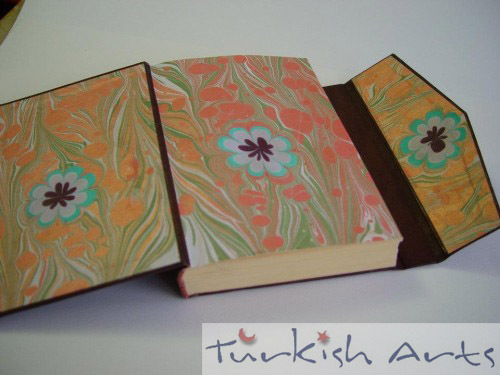 · In the past, Ebru Masters also used tobacco leaf water. – Paper: The paper has to be a good absorbent and a better quality of the paper gives better results. It has to be clean and smooth and also it should be about 1 cm smaller on its each side than the tray. The color mostly preferred is the cream color since it provides a very good contrast against all bright colors. 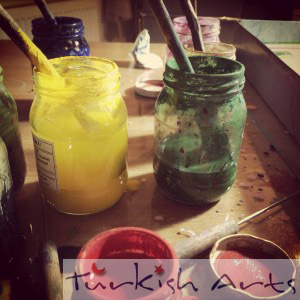 – Needles: They are used to draw the Ebru. – Glass Jars: Paints are kept in jars and some empty jars are also always kept beside the apparatus for making some new dyes. – Tub: It is made of galvanized iron, steel or aluminum with a size of 5x35x50cm. – Comb: Hand made combs. – Water: In ancient times, Masters were using the rainwaters but now, as the rain water is not so pure due to pollution, the Masters prefer distilled water. The water can be simple tap water but it must be as clean as drinkable water. • One thing worth mentioning here is that if you are using tap water then you cannot preserve the solution for more than 2 days. 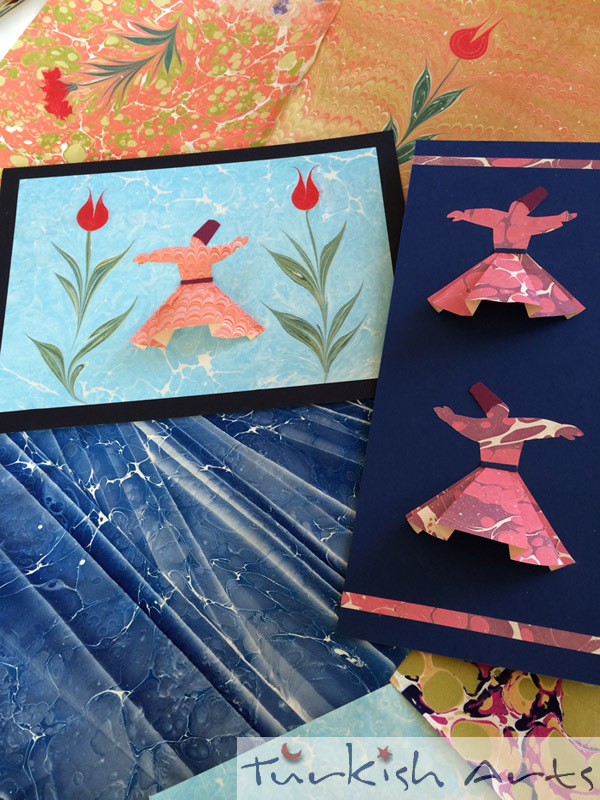 This entry was posted in Ebru Art (Marbling Paper) and tagged ebru, history of ebru, how to make ebru, how to make marbling, information about ebru art, introduction of ebru marbling, preparation of ebru.